December 7, 2018 EnlaceLeave a Comment on #DefundHate Campaign Update: There’s still time to take action! 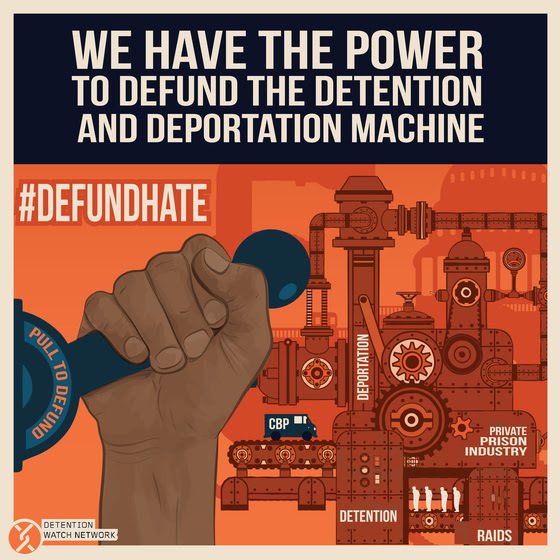 #DefundHate Campaign Update: There’s still time to take action! Congress just gave themselves two more weeks to negotiate how much money they want to give to Immigration and Customs Enforcement (ICE) and Customs and Border Protection (CBP), two agencies rotten to the core.While December 7th was the deadline for Congress to make a decision, Congress has agreed to a two week Continuing Resolution to keep the government funded. Congress will then have a new December 21st deadline to avoid a shutdown and try and broker a deal before the holidays. This deal may look like a one year continuing resolution where they keep funding levels the same as last year (while running the risk of anomalies to increase spending for certain things), or a new deal with some agreed upon amount for the wall, detention and agents. Newly released details on the death of Roxsana Rodriguez, a trans woman and asylum seeker from Honduras who died in ICE custody in May. A second autopsy report released last week found that Roxsana was physically abused prior to her death; many of those who were detained with her reported that Roxsana endured episodes of vomiting and diarrhea over days without any medical evaluation or treatment. She eventually died of complications from dehydration superimposed on HIV. Amar Mergensana died in ICE custody last Saturday. Prior to his death, Amar had bravely put his body on the line for a two month hunger strike while detained at the Northwest Detention Center in Tacoma, Washington to protest conditions and his own deportation. Samuel Oliver-Bruno, a longtime resident of North Carolina, was deported after 11 months in sanctuary. Samuel was tackled and arrested by ICE agents during a biometrics appointment with USCIS, a deeply concerning example of USCIS collusion with ICE. Samuel was deported less than a week after his brutal arrest. And last weekend border agents tear gassed asylum seekers in Tijuana, attacking immigrants trying to seek asylum in the United States. We also know that despite receiving funding to hold an average of 40,500 people in immigration detention every day, as of early November, ICE is holding nearly 4,000 more people per day than they have money for.What this all means is we still must weigh in with our members of Congress and tell them that we need cuts to ICE and CBP—no funding for hateful attacks against immigrant communities!The wall may be garnering the most headlines in the news, but it is not the entirety of the negotiation: Congress is also deciding how many agents and detention beds should be funded. They need to hear our voices. Sign and share the petition here!